The Failure of Capitalist Production is essential reading for all Marxists and lefts interested in what caused the Great Recession. It debunks the fads and fashionable arguments of neoliberalism, underconsumption and inequality with a battery of facts. It restores Marx’s law of profitability to the centre of any explanation of capitalist crisis with compelling evidence and searching analysis. It must be read. The thesis presented in the book stands out in a number of ways from many contemporary radical interpretations (notably the financialised-underconsumptionist thesis advanced by the influential Monthly Review … and that of the Marxist political geographer David Harvey). … Kliman provides far more compelling empirical evidence that American corporations’ rate of profit did not recover in a sustained manner after the early 1980s. … A crucial finding undermining the financialisation thesis is that Kliman demonstrates how American corporations have not, as is often claimed, invested a smaller share of their profit in production. …..Feb. 22. NEW YORK CITY. 8-9:50 PM. New School, talk sponsored by Student Action Initiative (open to public). 80 5th Ave., room 529. Corner of 14th St., Manhattan. Feb. 26. MOSCOW. 4 PM. Tsiolkovskiy Bookstore. Feb. 27. MOSCOW. 6 PM. Lomonosov Moscow State University, Marx Seminar, Faculty of Politics. …..Feb. 29. TAMPERE, Finland. 4:15 PM. University of Tampere, Linna Building, Väinö Linna Hall, Kalevantie 5, Tampere. Part 1 of seminar on“Origins of the Current Crises: Consequences and Political Alternatives” with talks by Alex Demirovic and Andrew Kliman. Origins of the Current Crises. …..March 1. HELSINKI, Finland. 3:15 PM. House of the Federation of Finnish Learned Societies, Lecture Hall 505, Kirkkokatu 6, Helsinki.Part 2 of seminar on “Origins of the Current Crises: Consequences and Political Alternatives“with talks by Alex Demirovic and Andrew Kliman. Consequences and Political Alternatives. …..March 6. SALFORD / MANCHESTER, UK. 6 PM. Mary Seacole G21 (ground floor), Salford University, Manchester. …..March 8. SHEFFIELD, UK. 7 PM. Sheffield University, Jessop West Exhibition Space (off Upper Hanover St.). …..March 10. NEWCASTLE, UK. 5 PM. Blackbull Pub, Mulgrave Terrace, Gateshead, Newcastle. …..Weekend of March 17-18. NEW YORK CITY – Left Fourm.Sunday March 18 at 3:00 PM. Pace University, 1 Pace Plaza, Manhattan. Panel on book. Speakers: Brendan Cooney, Barry Finger, Alan Freeman, Anne Jaclard, and Mike West. Mid-June. SOUTH KOREA. Write for details. July 9. LONDON. Marxism 2012 Festival (conference). Late July. BRAZIL. Write for details. DESCRIPTION OF BOOK, AUDIO/VIDEO INTERVIEWS, AND SYNOPSIS FOLLOW. Video: Kliman discusses the book at Bluestockings Bookstore in New York City, Feb. 6, 2012. Audio: Kliman and host Doug Lain discuss the book (causes of the Great Recession, inequality, underconsumptionism, the #Occupy movement, and more) on Diet Soap Podcast #125: Crisis and Capitalism’s System Failure (70 mins). Video: An interview by host Bill Weinberg on the Moorish Orthodox Radio Crusade in the World War 4 Report, “Andrew Kliman on the roots of the world financial crisis” (2 hrs 11 mins). Marx believed that the rate of profit has a tendency to fall, leading to economic crises and recessions. Many economists, Marxists among them, have dismissed this theory out of hand, but Andrew Kliman’s careful data analysis shows that the rate of profit did indeed decline after the post-World War II boom. He shows that free-market policies have failed to reverse that decline. This fall in profitability led to sluggish investment and economic growth, mounting debt problems, desperate attempts of governments to fight these problems by piling up even more debt –– ultimately ending in the Great Recession. Only $24.oo plus shipping from MHI. See ad at top of Literature Page for details and PayPal button. Chapter 2: Sets out the theoretical framework that underlies the empirical analyses that follow. It discusses key components of Marx’s theory of crisis––the tendential fall in the rate of profit, the operation of credit markets, and the destruction of capital value through crises––and how they can help account for the latest crisis and Great Recession. Chapter 3: Discusses the formation and bursting of the home-price bubble in the U.S., and the Panic of 2008 that resulted. It then discusses how Federal Reserve policy contributed to the formation of the bubble, arguing that the Fed wanted to prevent the United States from going the way of Japan. After Japan’s real-estate and stock-market bubbles burst at the start of the 1990s, it suffered a “lost decade,” and the Fed wanted to make sure that the bursting of the U.S. stock-market bubble of the 1990s did not have similar consequences. The latest crisis was therefore not caused only by problems in the financial and housing sectors. As far back as 2001, underlying weaknesses had brought the U.S. economy to the point where a stock-market crash could have led to long-term stagnation. Chapter 4: Examines a variety of global and U.S. economic data and argues that they indicate that the economy never fully recovered from the recession of the 1970s. Because the slowdown in economic growth, sluggishness in the labor market, increase in borrowing relative to income, and other problems began in the 1970s or earlier, prior to the rise of neoliberalism, they are not attributable to neoliberal policies. Chapter 5: Shows that U.S. corporations’ rate of profit did not rebound after the early 1980s. It also shows that the persistent fall in the rate of profit––rather than a shift from productive investment to portfolio investment––accounts for the persistent fall in the rate of accumulation. Chapter 6: Discusses why many radical economists dismiss Marx’s law of the tendential fall in the rate of profit and contend that the rate of profit has risen. They compute “rates of profit” that value capital at its current cost (replacement cost); almost everyone else uses the term “rate of profit” to mean profit as a percentage of the actual amount of money invested in the past (net of depreciation). The current-cost “rate of profit” did indeed rebound after the early 1980s, but the author argues that it is simply not a rate of profit in any meaningful sense. In particular, although proponents of the current-cost rate have recently defended its use on the grounds that it adjusts for inflation, he argues that it mis-measures the effect of inflation and that this mis-measurement is the predominant reason why it rose. Chapter 7: Looks at why the rate of profit fell. It shows that changes in the distribution of corporations’ output between labor and non-labor income were minor, and it decomposes movements in the rate of profit in the standard manner of the Marxian-economics literature. It then shows that an alternative decomposition analysis reveals that the rate of profit fell mainly because employment increased too slowly in relationship to the accumulation of capital. This result implies that Marx’s falling-rate-of-profit theory fits the facts remarkably well. The chapter concludes with a discussion of depreciation due to obsolescence (“moral depreciation”). It shows that the information-technology revolution has caused such depreciation to increase substantially and that this has significantly affected the measured rate of profit. The rates of profit discussed in Chapter 5 and prior sections of Chapter 7 would have fallen even more if they had employed Marx’s concept of depreciation instead of the U.S. government’s concept. Chapter 8: Examines underconsumptionist theory, which has become increasingly popular since the recent crisis. Contrary to what underconsumptionist authors contend, U.S. workers are paid more now, in inflation-adjusted terms, than they were paid a few decades ago, and their share of the nation’s income has not fallen. The rest of this chapter criticizes the underconsumptionist theory of crisis. In particular, it argues that the underconsumptionist theory presented in Baran and Sweezy’s influential Monopoly Capital rests on an elemental logical error. Chapter 9: Discusses what is to be undone. It argues that the U.S. government’s response to the crisis constitutes a new manifestation of state-capitalism, and it critically examines policy proposals based on the belief that greater state regulation, control, or ownership can put capitalism on a stable path. It then discusses the political implications of underconsumptionism and critique its view that redistribution of income would stabilize capitalism. Finally, it takes up the difficult question of whether a socialist alternative to capitalism is possible. Although the author does not believe that he has “the answer,” he addresses the question because he believes that the collapse of the U.S.SR. and the latest crisis have made the search for an answer our most important task. .
A tremendous amount has already been written on the financial crisis that erupted in 2007, the Panic of 2008, and the Great Recession to which they led. Many competent and insightful analyses of these events and the factors that triggered them are widely available elsewhere. Do we really need yet one more book on the subject? Probably not. This book therefore focuses more on the underlying conditions that set the stage for the crisis and recession, and less on the proximate causes of these events. 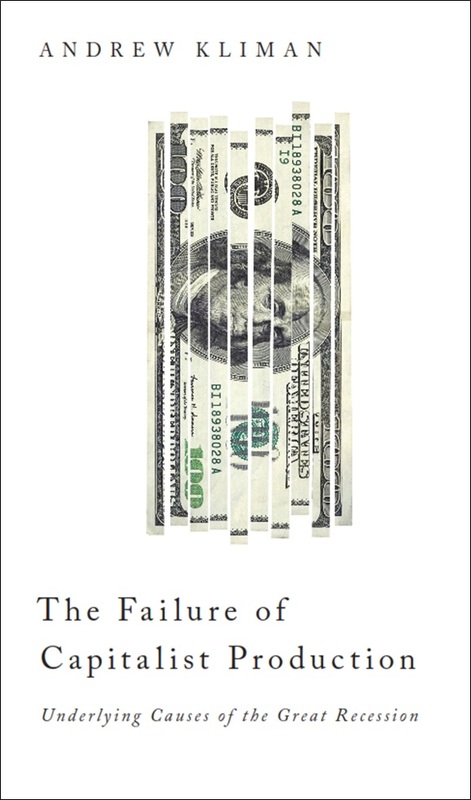 The “failure of capitalist production” in this book’s title is a reference, not to capitalism in general, but to specific and unresolved problems within the capitalist system of value production since the 1970s. I will argue that the economy never fully recovered from the recessions of the mid-1970s and early 1980s. I will put forward an explanation of why it did not. I will argue that the persistently frail condition of capitalist production was among the causes of the financial crisis. And, most importantly, I will argue that it set the stage for the Great Recession and “the new normal,” the state of not-quite-recession that we now endure. In light of the frailty of capitalist production, the recession and its consequences were waiting to happen. There is also reason to doubt that the financial crisis by itself––in the absence of longer-term conditions that reduced the economy’s ability to withstand shocks––would have triggered such a severe recession.The actual declines in production, employment, and income that took place, large as they were, are not true measures of the U.S. economy’s inability to absorb the shock of the financial crisis. The true measures are the declines that would have taken place if the Treasury had not borrowed madly to prop up the economy. In the first two years that followed the collapse of Lehman Brothers, it borrowed an additional $3.9 trillion, which caused its total indebtedness to rise by more than 40 percent. The additional debt was equal to 13.5 percent of the $28.6 trillion of Gross Domestic Product (GDP) that was produced during these two years. Yet despite the enormous increase in debt and the additional spending and tax cuts financed by means of it, real GDP at the end of the two years remained less than at the pre-recession peak. In contrast, the Treasury’s debt declined in the two years between mid-1929 and mid-1931, and by mid-1932 it was still only 15 percent greater than in mid-1929. It is likely that the latest recession would have been almost as bad as the Great Depression, maybe even worse, if the government had refrained from running up the public debt. The rate of profit—that is, profit as a percentage of the amount of money invested—has a persistent tendency to fall. However, this tendency is reversed by what John Fullarton, Karl Marx, and others have called the “destruction of capital”––losses caused by declining values of financial and physical capital assets or the destruction of the physical assets themselves. Paradoxically, these processes also restore profitability and thereby set the stage for a new boom, such as the boom that followed the Great Depression and World War II. During the global economic slumps of the mid-1970s and early 1980s, however, much less capital value was destroyed than had been destroyed during the Depression and the following World War. The difference is largely a consequence of economic policy. The amount of capital value that was destroyed during the Depression was far greater than advocates of laissez-faire policies had expected, and the persistence of severely depressed conditions led to significant radicalization of working people. Policymakers have not wanted this to happen again, so they now intervene with monetary and fiscal policies in order to prevent the full-scale destruction of capital value. This explains why subsequent downturns in the economy have not been nearly as severe as the Depression. But since so much less capital value was destroyed during the 1970s and early 1980s than was destroyed in the 1930s and early 1940s, the decline in the rate of profit was not reversed. And because it was not reversed, profitability remained at too low a level to sustain a new boom. The chain of causation is easy to understand. The generation of profit is what makes possible the investment of profit. So, not surprisingly, the relative lack of profit led to a persistent decline in the rate of capital accumulation (new investment in productive assets as a percentage of the existing volume of capital). Sluggish investment has, in turn, resulted in sluggish growth of output and income. All this led to ever more serious debt problems. Sluggish income growth made it more difficult for people to repay their debts. The decline in the rate of profit, together with reductions in corporate income tax rates that served to prop up corporations’ after-tax rate of profit, led to greatly reduced tax revenue and mounting government budget deficits and debt. And the government has repeatedly attempted to manage the relative stagnation of the economy by pursuing policies that encourage excessive expansion of debt. These policies have artificially boosted profitability and economic growth, but in an unsustainable manner that has repeatedly led to burst bubbles and debt crises. The latest crisis was the most serious and acute of these. Although the financial crisis is over, and the recession officially ended two years ago, the debt problems persist––within the European Union, they are now critical––as do massive unemployment and the severe slump in home prices. These problems seem to be the main factors that have kept the U.S. economy from growing rapidly since the end of the recession. For a long time, Americans were willing to increase their borrowing and reduce their saving, since they believed that increases in the prices of their houses and shares of stock were an adequate substitute for real cash savings. But those increases have vanished, and many people are worried about whether they will hold on to their jobs and homes, so they have begun to borrow less and save more. And because of continuing debt, unemployment, and housing-sector problems––and probably because of concerns that they will suffer additional losses on existing assets and ultimately have to report losses that they have not yet “recognized”––lenders are less willing to lend. The low level of borrowing/lending has caused spending and economic growth to be sluggish. I certainly do not advocate full-scale destruction of capital value––or any other policies intended to make capitalism work better; it is not a system I favor. Yet the destruction of capital value would indeed be a solution to the systemic problems I have outlined––unless it led to revolution or the collapse of the system. A massive wave of business and personal bankruptcies, bank failures, and write-downs of losses would solve the debt overhang. New owners could take over businesses without assuming their debts and purchase them at fire-sale prices. This would raise the potential rate of profit, and it would therefore set the stage for a new boom. If this does not happen, I believe that the economy will continue to be relatively stagnant and prone to crisis. This is not a book that I set out to write. At the start of 2009, I began the empirical research that eventually became the core of the book, but at the time I had a different, and very limited, objective in mind. However, I soon discovered things that impelled me to dig deeper and widen the scope of my research. According to conventional wisdom, the rate of profit fell from the start of the post-World War II boom through the downturns of the 1970s and early 1980s. But by that time, economic policy had become “neoliberal” (free-market), and this led to increased exploitation of workers. Consequently, U.S. workers are not being paid more, in real (inflation-adjusted) terms, than they were paid decades ago, and their share of income has fallen. The increase in exploitation led to a significant rebound in the rate of profit. Normally, this would have caused the rate of accumulation to rise as well, but this time it did not. The conventional account blames the “financialization” of the economy for the failure of the rate of accumulation to rebound. It holds that financialization, another component of neoliberalism, has induced companies to invest a larger share of their profits in financial instruments, and a smaller share in the productive capital assets (factories, machinery, and so on) that make the “real” economy grow. As a result, economic growth has been weaker during the last several decades than it was in the first few decades that followed World War II, and this factor, along with additional borrowing that enabled working people to maintain their standard of living despite the drop in their share of income, has led to long-term debt problems. These debt problems, and other phenomena that also stem from financialization, are said to be the underlying causes of the latest economic crisis and slump. US corporations’ rate of profit did not recover in a sustained manner after the early 1980s. Their before-tax rate of profit has been trendless since the early 1980s and a rate of profit based on a broader concept of profit, more akin to what Marx meant by “surplus-value,” continued to decline. Neoliberalism and financialization have not caused U.S. corporations to invest a smaller share of their profit in production. Between 1981 and 2001, they devoted a larger share of their profit to productive investment than they did between 1947 and 1980 (and the post-2001 drop in this share is a statistical fluke). What accounts for the decline in the rate of accumulation is instead the decline in the rate of profit. U.S. workers are not being paid less in real terms than they were paid decades ago. Their real pay has risen. And their share of the nation’s income has not fallen. It is higher now than it was in 1960, and it has been stable since 1970. These findings do no damage to the claim that a long-term buildup of debt is an underlying cause of the recent crisis and subsequent problems. However, all of the other causal claims in the conventional leftist account fall to the ground. The conventional wisdom implies that the latest economic crisis was an irreducibly financial one. Of course, a financial crisis triggered the recession, and phenomena specific to the financial sector (excessive leverage, risky mortgage lending, and so on) were among its important causes. But what I mean by “irreducibly financial” is that conventional wisdom on the left holds that the recent crisis and slump are ultimately rooted in the financialization of capitalism and macroeconomic difficulties resulting from financialization. The persistent frailty of capitalist production supposedly has nothing to do with these macroeconomic difficulties. Indeed, on this view, the capitalist system of production has not been frail at all, since the rate of profit, the key measure of its performance, recovered substantially after the early 1980s. The political implications of this controversy are profound. If the long-term causes of the crisis and recession are irreducibly financial, we can prevent the recurrence of such crises by doing away with neoliberalism and “financialized capitalism.” It is unnecessary to do away with the capitalist system of production––that is, production driven by the aim of ceaselessly expanding “value,” or abstract wealth. Thus, what the crisis has put on the agenda is the need for policies such as financial regulation, activist (“Keynesian”) fiscal and monetary policies, and perhaps financial-sector nationalization, rather than a change in the character of the socio-economic system. If, on the other hand, a persistent fall in the rate of profit is an important (albeit indirect) cause of the crisis and recession, as this book argues, then these policy proposals are not solutions. At best, they will delay the next crisis. And artificial government stimulus that produces unsustainable growth threatens to make the next crisis worse when it comes. The economy will remain sluggish unless and until profitability is restored, or the character of the socio-economic system changes. Quite a few books have put forward different leftist perspectives on the recent crisis and recession. Many of them focus, as have most other books on these topics, on the proximate causes of these events. This book differs from them, as I noted above, in that it focuses on the long-term, underlying conditions that enabled the financial crisis to trigger an especially deep and long recession, and one with persistent after-effects. Yet a fair number of other books from the left also focus on the underlying causes. Some of them––such as Foster and Magdoff (2009), Harvey (2010), Duménil and Lévy (2011), and McNally (2011)––put forward some version of the conventional leftist account discussed above. And some, like the works by Foster-Magdoff and Harvey, also stress the supposed facts that workers’ share of total income declined and that this led to a lack of demand that was covered over by rising debt. From such a perspective, the crisis appears not to be a crisis of capitalism, but a crisis of a specifically neoliberal and financialized form of capitalism. I do not think the facts are consonant with these views, and I trust that disinterested readers will find, at minimum, that this book’s empirical analyses call such views into question. On the other hand, some other books from the left have appeared that regard the crisis as a crisis of capitalism, and that take issue with the conventional account or parts of it––including Harman (2009), Roberts (2009), Carchedi (2011), and Mattick (2011). To these can be added articles such as Desai and Freeman (2011), Onishi (2011), and Potts (2011). I do not agree with all of these works in all respects, but I am proud that this book can now be counted among them. Except for the book by Duménil and Lévy, this book contains the most in-depth and comprehensive data analyses of any of the works I have cited above, as well as most other books on the topic. And among the works that take issue with the conventional leftist account, its treatment of the underlying causes of the Great Recession is arguably the most comprehensive. To some degree, this book’s differences with the conventional account reflect methodological and theoretical differences. Like most of its other critics cited above, I am a proponent of the temporal single-system interpretation (TSSI) of Marx’s value theory. It has long been alleged that the value theory and the most important law based upon it––the law of the tendential fall in the rate of profit (LTFRP), the core of Marx’s theory of capitalist economic crisis––are internally inconsistent and must therefore be corrected or rejected. However, TSSI research has demonstrated that the inconsistencies are not present in the original texts; they result from particular interpretations. When Marx is interpreted as the TSSI interprets him, the inconsistencies disappear (see, for example, Kliman 2007). As Chapter 6 will discuss in more detail, the TSSI’s ability to reclaim Marx’s Capital from the myth of inconsistency impinges upon the controversy over the underlying causes of the Great Recession in the following way. In their supposed proofs that the LTFRP is internally inconsistent, his critics replace the temporally determined rate of profit to which his theory refers with an atemporal “rate of profit” (the current-cost or replacement-cost rate), and they then find that Marx’s law does not survive this process of substitution. Those who have accepted these proofs have also accepted the manner in which the proofs mis-measure the rate of profit. 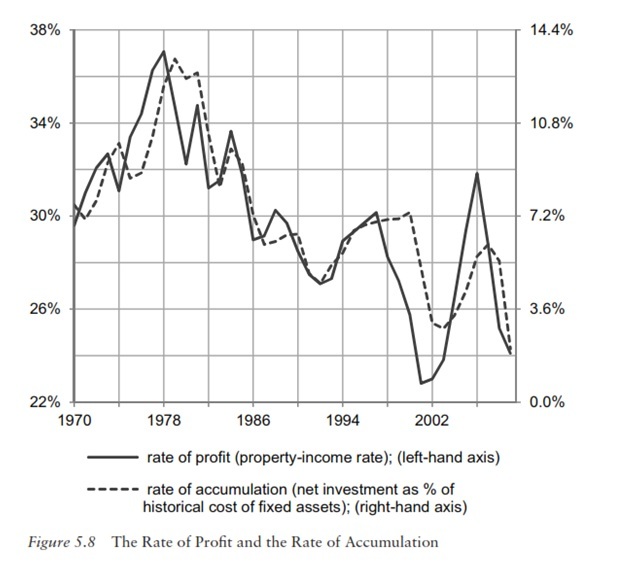 Thus, when they found that the atemporal “rate of profit” trended upward after the early 1980s, they took this as conclusive evidence that capitalist production has been sound, and that the true underlying causes of the Great Recession are therefore neoliberalism, financialization, and heighted exploitation. Analysis of actual rates of profit leads to quite different conclusions. However, I do not want to overstate the role of methodological and theoretical differences. Prior to analyzing the data, I had no prior belief that actual rates of profit had failed to rebound since the early 1980s, and I even wrote that “profitability has been propped up by means of a decline in real wages for most [US] workers” (Kliman 2009: 51), which I believed to be an unambiguous fact. Methodology and theory greatly influence the kinds of questions one asks and the data one regards as significant, but they have no influence over the data themselves. In other words, this book is an empirical analysis, not a theoretical work. Even my claim that the atemporal “rate of profit” is not a rate of profit in any normal sense of the term is an empirical claim. If it, and this book’s other claims and findings, are “true for” those who find its conclusions appealing, they are no less “true for” those who do not. Not everything is a matter of perspective. If I can now say that a persistent decline in U.S. corporations’ profitability is a significant underlying cause of the Great Recession, and that Marx’s explanation of why the rate of profit tends to decline fits the facts remarkably well, it is because I have crunched and analyzed the numbers. I could not have said these things a few years ago. I eagerly await my copy of your book, which I understand has already been mailed out. As I told you I am serializing a book on http://www.Anarkismo.net, on An Anarchist’s Introduction to Marx’s Critique of Political Economy, and I expect to list your book as worth further reading (I have already written in you last book as the best response to the attacks on Marx’s theories of value and of the falling rate of profit). However I have two minor comments, based on your remarks about the Monthly Review theorists (Foster et al.) . It is, of course true that they reject the tendency of the falling rate of profit in favor of an underconsumptionist view. And they waffle on the labor theory of value. And politically Foster does not face up to the MR’s history of rejecting the working class as revolutionary subject. All too true. But they do not blame financialization for causing the crisis. They explicitly reject that approach. They insist that it is the trend toward stagnation in the real economy which has caused the turn toward financialization, and that attempts to redirect investment into the real economy away from finance would not work for that reason. They also say that there has been a long term trend toward stagnation and decline in capitalism, with a temporary upsurge in the 50s, etc., but a return to the decline and stagnation from about 1970 on. With ups and downs, and the overall trend being hidden at times by financialization but not escaped. Now it seems to me that this trend is itself evidence for the tendency toward a falling rate of profit. How else would it show itself but in a trend towad stagnation? Of course, that is not their theory, which is the dopey one that there is too much “surplus” produced to invest and therefore the system does not produce “surplus”. Just a few thoughts. Look forward to your book. “It was the reality of economic stagnation beginning in the 1970s … that led to the emergence of ‘the new financialized capitalist regime,’ … whereby demand in the economy was stimulated primarily ‘thanks to asset-bubbles.’ … But such a financialized growth pattern was unable to produce rapid economic advance for any length of time, and was unsustainable …. The formulations are not the crispest, but I interpret this as an effort to fuse underconsumptionism and the notion of that the latest crisis is a crisis of “financialized capitalism.” Supposedly, a “new financialized capitalist regime” emerged in which demand was stimulated primarily through bubbles, but it eventually collapsed because demand couldn’t keep up in the end, due to a supposed fall in workers’ share of income. I discuss this, and Foster-Magdoff’s “falling ratio of wages and salaries as a percentage of national income” in the book. Thank you for this tour de force. Your first book, Reclaiming Marx’s ‘Capital:’ a refutation of the myth of inconsistency, vindicated the theoretical coherence of the law of the tendential fall in the rate of profit. The Failure of Capitalist Production demonstrates its awesome explanatory power. What blood, sweat, and tears you must have expended to bring so many econometric threads and so much empirical data into such splendid order, in order to get to what’s needed: an understanding and explanation of the “underlying causes of the Great Recession.” Congratulations are especially due from non-economists like me. There is a pretty epic debate going on libom.org about this book, but specifically on the ‘workers compensation’ findings. 1. Though he would appear to be unaware of it, Andrew Kliman’s account of the capitalist crisis in his book, were it accurate, would not be a demonstration, but a refutation of Marx’s theory of the falling rate of profit. 2. Marx’s theory is that the dynamic of accumulation is the production of relative surplus value, whereby the increased productivity of labour cheapens the means of subsistence so that workers are paid less and a greater share of the total output falls to the capitalist class. The accumulation of capital, then has as its foundation the increase of surplus value relative to the workers’ consumption, the value of labour power. But, says Marx, the increase in surplus value gives rise to a fall in the ratio of profit to the total capital advanced. This is because a greater share of the surplus must be invested in means of production to achieve the increase in labour productivity, so that over time the ratio of the surplus to the capital invested in both wages and means of production falls. 3. Andrew Kliman claims to have demonstrated an empirical fall in the rate of profit, and that this demonstrates the rightness of Marx’s theory. But he also claims to have demonstrated empirically that the value of labour power, the value of workers’ compensation has been constant, from the 1970s right up to 2007. These two ‘findings’ cannot be reconciled with Marx’s theory of accumulation. If the rate of profit is falling, and the value of labour power is constant then profit rates are not falling because of the accumulation process, otherwise labour power would be falling, too. Were Kliman right about the empirical evidence, then he would have demonstrated that Marx’s theory was wrong, or at least that the empirical fall in the rate of profit was not due to the accumulation process. 4. Kliman largely misunderstands Marx’s theory. Kliman thinks that the rate of profit determines the rate of investment. But Marx thinks the opposite, that the rate of investment determines the rate of profit. Marx does think that in an economic crisis the rate of profit falls so low that further investments become impossible. But there are no permanent crises, which are by definition singular events, so Kliman’s claim that the low level of profit is the cause of a low level of investment turns Marx’s theory that the rate of accumulation determines the rate of profit on its head. 5. Kliman largely misunderstands Marx’s method. Marx saw capitalism as a dynamic system that revolutionised the means of production – so much so that it undermined its own basis. As Marx explains it, it is the dynamic of capital accumulation that throws up the barriers to its further development. Kliman, contrariwise separates out the limiting factor (the falling rate of profit) and makes it an independent variable unconnected to the accumulation process. 6. Kliman insists against all the evidence that the defeats of the labour movement, and the international left in the 1980s had no consequence for the balance of power between the classes. He insists that there was no substantial recovery of capitalist accumulation from the profound recession of 1982 and that the defeat of the working class did not lay the basis for that recovery. 7. In fact the suppression of wage inflation was – as is universally understood – the basis for the recovery, as capitalism expanded extensively drawing billions of additional workers into its orbit on reduced incomes. In the US alone the workforce expanded by 46 per cent, drawing 46 million additional workers, immigrants and women into the workforce between 1983 and 2007. The European Union expanded its workforce similarly through growth in immigration, recruiting women, and incorporating the ten former East European states into its labour force. In China and the former USSR market reforms increased the workforce by millions, as did the recruitment of rural peasants into capitalist production in India and the Far East. To imagine that there was no dynamic towards the extensive growth of capitalism in the 1990s, consequent upon the defeats of the labour movement and left in the 1980s is to stand outside of history. 8. The capitalist recovery of the 1990s did have serious deformities that would undercut its expansion and give rise to the crisis of 2007. But Kliman’s attempt to force these events into a classical Marxist theory of a crisis of over-accumulation are mistaken. Contrary to Marx’s theory, the economic dislocation of 2007 does not come after a period of intensive growth, where capital outlay on means of production outstrips outlay on wages. Rather the preceding growth period is one of extensive, job-rich growth, where outlay on wages far outstripped investment in new technologies. 9. The current economic crisis is largely an effect of the capitalists’ subjective retreat from production. The resolution of the preceding economic crisis was so damaging to the internal coherence of the capitalist elite that they have recoiled from developing the productive forces, through new investments or technological innovations, in particular where these would seem to threaten social upheaval. The low rates of investment come about because of this retreat from production, not because of a classical overaccumulation crisis. 10. In my review I wrote that Andrew Kliman ‘scoffs at those like Doug Henwood who point to the fall in the workers’ share of output as the basis of a renewed capitalist expansion’. Which is true – he does reject that argument. Andrew Kliman objects to the calculation that shows that workers compensation was stagnant while productivity rose. He says that it only appears that way because of the different ways that workers compensation and productivity are calculated. The first is adjusted for inflation on the basis of a price index of consumer goods (housing, utility bills, groceries and so on). The second is adjusted for inflation on the basis of a price index of capital goods (raw materials, industrial machinery, rental on plant and offices and so on). But this adjustment is entirely proper. When trying to understand how workers’ compensation has moved, it is right to look at the basket of goods that they can command with their wages. After this adjustment, they are stagnant. The mass of profits, by contrast has continued to rise, as labour productivity has continued to rise. A number of economists like Paul Krugman, Thomas Picketty and Doug Henwood have drawn the conclusion that the workers share of output has fallen relative to the total. Kliman adjusts the statistics to show the opposite. Andrew Kliman takes out the statistical adjustment for inflation to show, he claims, that workers’ compensation has kept up with productivity. If workers could only forego housing, utility bills and groceries, and live instead on raw materials and industrial machinery, sleeping in factories, he would be right. I am happy to accept the authority of these respected economic writers over Kliman.